Both Madison (Mads) and Billy have their futures ahead of them - futures heavily shaped by their mothers. And, perhaps, by each other. But when the story starts, when their stories first intersect, only one of them is present: Mads, when her morning swim leads her straight into the path of a body, a woman who has taken her own life: Billy's mother. Deb Caletti imbues all of her stories with realistic sensibility and captivating characters. 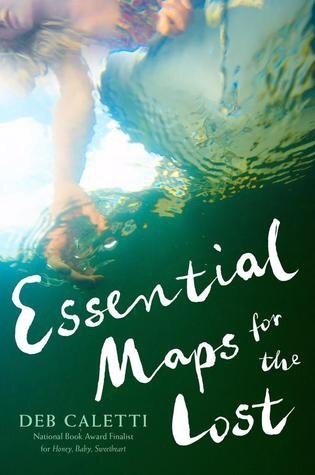 Though the premise outlined above may sound grim, Essential Maps for the Lost is buoyed by hope: hope for better days, hope for positive change. The story is led by two characters who struggle to take control over their own lives while they search for reasons or answers related to recent events. Written in third person, the book flips back and forth between Billy and Mads, allowing the reader to see both perspectives - which is especially interesting when they are in the same scene, so the dual narrative allows us to be privy to both characters' thoughts. The third person style also permits a cool omniscient element, with occasional phrases directing the reader's attention to something - almost like a finger pointing, "Look there," "Remember this moment later" - that are more like gentle nudges than pushy wink-wink moments. Billy and Mads, both post-high school and both innate caretakers, have found jobs they love: Billy works at a no-kill animal shelter and literally rescues dogs, while Mads babysits a baby girl that she wishes she could protect from the world. But neither of them are happy at home. Billy now lives with his grandmother, a woman full of cruel remarks and judgements about her late daughter, while Mads is staying with her aunt, uncle, and cousin for the summer while she takes real estate classes at Bellevue Community College - all part of her mother's plan for Mads to become her working partner the second she passes the licensing exam. But once Mads and Billy meet, once their lives collide, their futures change. Or is it that their options change, and their true futures reveal themselves? It is not easy to alleviate the burdens of the abandoned or create a map for the lost. It takes courage to face the ogres of depression and loss. With strength of spirit combined with gut instincts and personal truths, Mads and Billy find their way out of the deep and onto their next journey. I had no idea that this had happened. When people are asked to name massive ships sunk on the open sea, everyone knows about the Titanic and the Lusitania, but the Wilhelm Gustloff is not on anyone's radar. It really should be. The sheer loss of life from this single maritime disaster was and is astounding. In this terrific piece of historical fiction, Sepety's masterfully weaves the stories of a ragtag group fleeing in front of the Soviet advance across former Prussian territory at the close of World War II, a young German naval recruit preparing the ship to sail, and a Prussian teen escaping his past. As the Soviets press the Nazis back, foreigners, the wounded, the sick, Jews and all others considered to be of lesser stock than themselves are all rounded up and either executed or shipped off to a gulag. This truly is a wonderful and tragic story. Despite the fact that these characters were not real people, we get a real sense of what it must have been like to flee from the Soviet invasion from the East pressing toward the unknown of the German occupation farther West. Which empire is the lesser of the two evils? I would highly recommend this to those that liked Code Name Verity or The Book Thief. Labels: Road Trips , Survival , War - What Is It Good For? Do you enjoy audiobooks, or want to try out some audiobooks? Then you're in luck! SYNC, the annual free summer audiobook program for teens, kicks off next week, when Vivian Apple at the End of the World by Katie Coyle and The Great Tennessee Monkey Trial by Peter Goodchild will be available to download. You'll need to have the OverDrive app installed on your device or computer, and will probably have to enter your name and email address in order to download the audiobooks, but that's it (and you won't get any spam). 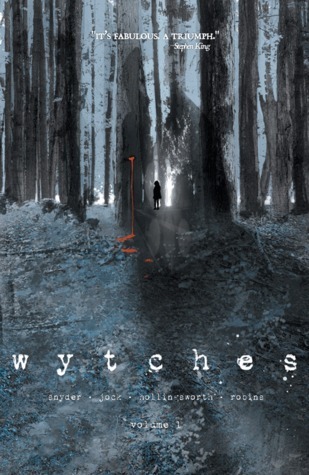 I should put a disclaimer on this, Wytches, as awesome as it is, is definitely not for younger readers. I would recommend this to much older teens & adults only. Now on to the review. The last time I remember being scared by a comic was when I was ten and I read too many Punisher War Journals - the ones where the Punisher gets sent to prison and has to take on a terrifying villain named Jigsaw. I'm a grown man now, it's impossible for a comic to scare me, right? Wrong! Wytches is extremely unsettling and I loved every second of it. After a terrible tragedy, the Rooks family decide to pack up their belongings and move to the small town of Litchfield. Everything seems fine until they realise that the horror that prompted their move has followed them. Sailor, the Rooks' daughter, is the target of this malevolent force. Convinced she may be losing her mind, she is considered a freak by her peers and an anomaly by the school psychologists. Nobody realises the truth: that Sailor has been pledged to the Wytches, and pledged is pledged. I have a passing knowledge of spiritual lore and can usually tell a jumbie from a douen and a la diablesse from a soucouyant. With that said it is always good to see new twists on old themes and yfic novels featuring minority characters. The cover image on the book features a proud Latina and that will definitely attract some readers (and perhaps turn off others). Maybe it's because I'm a sucker for underdog stories. Or because I'm a sucker for stories with strong female characters (though the main character is a dude). Or because I really dig stories set in China. Or because I really like stories involving the martial arts. Regardless, this story has it all. And then some. And I find myself wanting to rave about it, as I've wanted to do from the moment it arrived in my house in January, along with a note saying "please hold your review until April". AGONY!!! 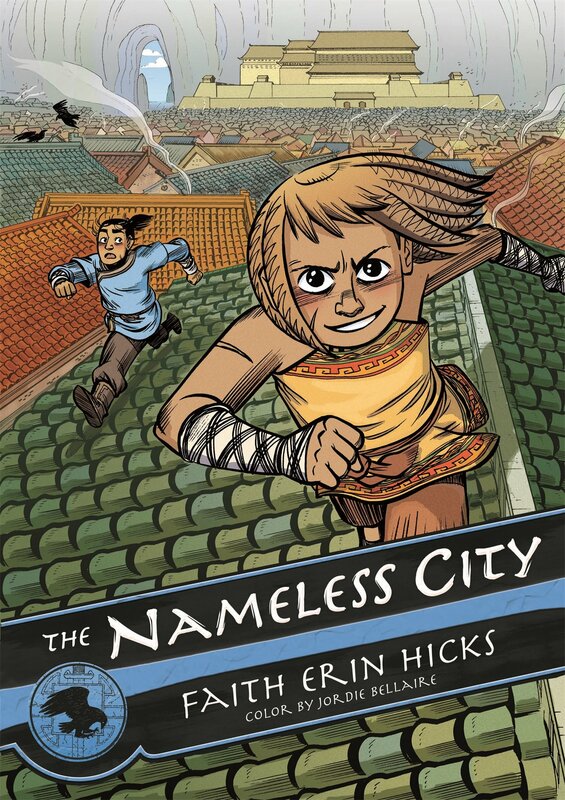 The Nameless City is at least partially about a city in China. The city is located at a key geographical spot, and has been conquered and re-conquered by a variety of tribes, clans, and empires. Each one names the city as it sees fit, but the people who are native to the city, who have lived there for ages, consider it the "nameless city", and they themselves are the nameless. Seriously, even after saying all that, I worry that I haven't conveyed the half of what this graphic novel touches on. You should probably read it for yourself. Stealing the credit card was a spur of the moment impulse for twelve year old Timothy. Now he is on probation, and to avoid a stint in juvie, he is under house arrest for one year. Timothy didn't steal the credit card for himself. He stole it so he could use it to pay for his brother's medications. That card made it easy to get a month's worth of life-saving meds for Levi. Timothy was only hoping to make things easier for his mother and better for his little brother. Baby Levi was born with subglottic stenosis which causes a constricted airway requiring a trach tube so he can breathe. Taking care of Levi is expensive and requires full-time assistance. Since their mother has to work, much of Levi's care falls to Timothy. Even with lots of overtime, it is hard for her to scrape together enough money to pay for in home care, medications, and the frequent hospital stays involved with Levi's condition. After the credit card incident, Timothy spends time with James, his court-ordered probation officer, and Mrs. B, a court-ordered therapist. The judge orders Timothy to write in a journal and share it weekly. James wants him to write about how he promises not to steal anything ever again, and Mrs. B. wants him to write about his feelings. 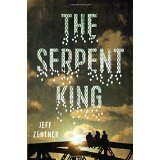 Timothy reluctantly begins, but over time, he finds the writing provides a great way to vent. Author K.A. Holt tells Timothy's story through his journal entries over the course of one year. In straight forward free verse, Holt is able to capture Timothy's frustrations, humor, and tremendous love for the little brother who has changed everyone's life. 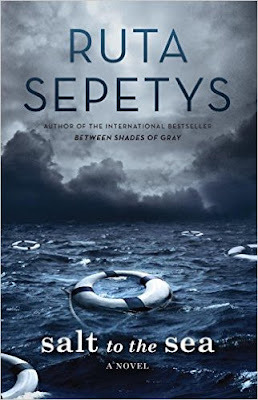 Holt's own experience with a critically ill child gives HOUSE ARREST an authenticity that will grab readers and keep them thinking about Timothy and Levi long after the last page is turned. Previously posted at Reading Junky's Reading Roost.